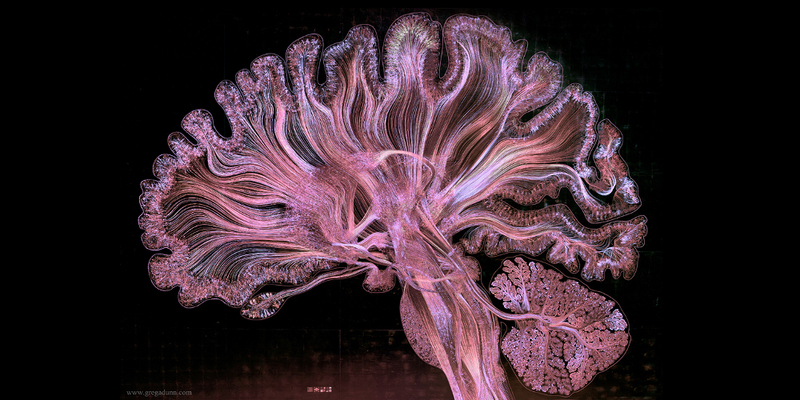 Dr. Greg Dunn (artist and neuroscientist) and Dr. Brian Edwards (artist and applied physicist) created Self Reflected, the world’s most complex artistic depiction of the human brain, to reveal insight into the complexity of consciousness by revolutionizing the way in which the average person thinks about the brain. Self Reflected bridges the visual and conceptual connection between the macroscopic brain and the microscopic behavior of neurons by fusing neuroscientific data, hand drawings, algorithmic manipulation, optical engineering, photolithography, and gilding to etch half a million neurons into large sheets of gold. The result, a technique called reflective microetching, uses animations created through reflected light to create an ultraprecise depiction of the enormous scope of beautiful and delicately balanced neural choreographies designed to reflect what is occurring in our own minds as we observe this work of art. Self Reflected was created to remind us all that the most marvelous machine in the known universe is at the core of our being and is the root of our shared humanity. Dr. Greg Dunn (US) is an artist who received his PhD in neuroscience from the University of Pennsylvania in 2011. While a graduate student, Dunn’s artistic experiments demonstrated that the qualities of neural forms fit seamlessly into the aesthetic principles of minimalist Asian art. Greg invented the revolutionary technique reflective microetching together with Dr. Brian Edwards (US), an applied physicist who is the only recipient of Greg Dunn’s prestigious honorary distinction Beast of Knowledge. An experimentalist with a capital E, Brian likes to make things work and doesn’t care if he gets electrocuted, burned, or poisoned in the process. Will Drinker (US) is a filmmaker, documentarian, producer, puppeteer, ventriloquist, musician—a man dedicated to his craft who does not rest until the shot is got.